Luton Town’s hunt for a permanent manager took on an even greater significance after yet another thoroughly inept defeat, this time at the hands of Bristol Rovers. 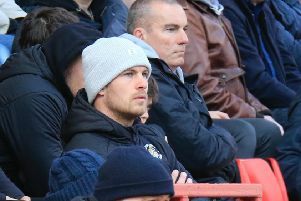 With well over two weeks passing since John Still left the club, results and performances are showing no real signs of picking up any time soon, as Luton have now taken just four points from a possible 12 since his departure, with the side lacking any real clear direction that a full time boss would undoubtedly instil. If Hatters’ supporters had thought a change in year would herald a change in fortune, they were left seriously misguided, witnessing a turgid display, in which their side once more failed to a muster single shot on target. Luton’s lack of potency is fast becoming a worrying theme of caretaker boss Andy Awford’s caretaker reign, as home stopper Steve Mildenhall was untested, making it a pathetic single attempt in three games now. Awford, who had the reins for the fourth game since John Still’s departure, made two changes to the side who drew 0-0 at Portsmouth, with Craig Mackail-Smith and Cameron McGeehan coming in for Jack Marriott and Josh McQuoid. However, rather than try to take the game to the opposition and blast their way out of the recent slump, Luton yet again set up with a defensive mindset from the first whistle, looking like they were intent on containment as opposed to anything more adventurous. Town were thankful to a fine early block from captain Scott Cuthbert after Stuart Sinclair beat the offside trap as the Luton back-line looked less than secure once more, although they did win a host of corners, thanks to the incessant scampering from Mackail-Smith. The third delivery finally caused the Pirates a modicum of concern too, Paul Benson’s diving header flying wide of the far post. With Hatters’ defence giving their supporters a number of nervy moments, Rovers had the ball in the net on 27 minutes, only to see it disallowed for a quite blatant block on Cuthbert by Rory Gaffney in the build-up. Town were then indebted to keeper Mark Tyler for a superb stop five minutes before the break as a quickfire counter saw Gaffney backheel for Mansell, but the keeper reacted excellently to tip over. Luton had their moments in the first period, as they took up some promising positions, but that was all they were as Mildenhall was to enjoy a comfortable opening 45. After the interval, Gaffney wasted a glorious opportunity just 14 yards out, when picked out by Daniel Leadbitter’s pinpoint low cross, he skied over the bar. Luton still couldn’t send anything clear-cut at the hosts goal, McGeehan’s hopeful long-ranger not coming down in time, although Hall was closer, his left-footer into the side-netting, meaning Mildenhall had to at least muddy his kit. Just as Luton looked to be building something resembling a head of steam, the hosts were in front on the hour mark as a corner met by the unmarked Tom Lockyer and cleared off the line by Howells. However, the lurking Gaffney was left all alone to whack the loose ball home as a livid Tyler remonstrated with his defence. Awford brought on Paddy McCourt for Howells to move to a 3-5-2 formation, but still the Pirates attacked, Sinclair’s effort straight at Tyler. In fact, Rovers went on to sew up the points up with 17 minutes to go after a howler from Tyler. The hosts’ attacked down the left, as the cross found Gaffney all alone once more. His first effort was tamely straight at the keeper, who somehow spilled it allowing Rovers’ on-loan front man to tap home. Luton enjoyed some possession in advanced positions late on, but never once looked like even nabbing a consolation, as Steve O’Donnell hacked badly wide, summing up their lacklustre afternoon. Rovers: Steve Mildenhall, Daniel Leadbitter, Lee Brown, Tom Lockyer, Tom Parkes, Lee Mansell (C), Ollie Clarke, Matty Taylor (Jermaine Easter 87), James Clarke, Stuart Sinclair, Rory Gaffney (Ellis Harrison 90). Subs not used: Kieran Preston, Mark McChrystal, Chris Lines, Cristian Montano, Billy Bodin. Hatters: Mark Tyler, Stephen O’Donnell, Jake Howells (Paddy McCourt 67), Magnus Okuonghae, Scott Cuthbert, Alex Lawless, Jonathan Smith, Cameron McGeehan, Ryan Hall, Paul Benson (Josh McQuoid 75), Craig Mackail-Smith (Jack Marriott 82). Subs not used: Elliot Justham, Olly Lee, Sean Long, Luke Wilkinson. Booked: Hall 10, Cuthbert 15, Howells 43, Taylor 65, McCourt 86.